AIR-SCENT® International’s popular brand of refills now offers new packaging with a wider variety of options! Available on August 1, 2016, our Air-Scent® Solid Squair™ air freshener wafers will be able to order up to 8 fragrances per case. In addition to being clearly labeled, the enhanced graphics on the new packaging increase the value proposition in the eyes of your customers. Air-Scent’s® commitment to manufacturing and distributing only high-quality, professional air freshener systems and totally effective 30-day refills means that we are tuned into the needs of our customers, and are dedicated to providing the latest in air freshening technology. AIR-SCENT® International is proud to be a leader in totally-effective odor control solutions, and our willingness to strive for perfection in our products, as well as researching the market and new technologies is what makes us recognized as a world leader in the industry. 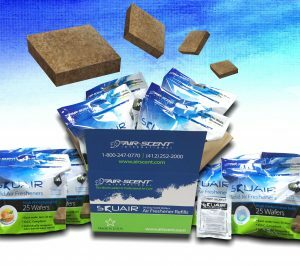 For more information on our Air-Scent® Solid Squair™ air freshener wafers, or any of our other odor control products, contact us today.